For First Time Ever, Country’s 30 Most Famous Singers Release THIS Song Together, To Honor The 50th CMAs. For the past 50 years, the Country Music Association has been dedicated to “bringing the poetry and emotion of Country Music to the world.” They function to foster “a spirit of community and sharing” in order to “respect and encourage creativity and the unique contributions of all.” Poetry, emotion, community, and creativity… The music video below has it all. The CMA Country Music Association just released the music video in celebration of the 50th annual CMA Awards, coming up this November. 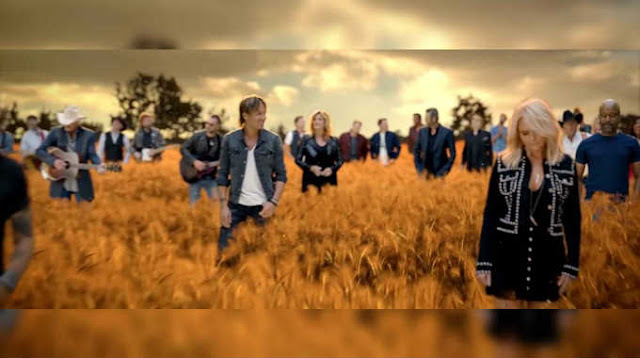 The video– titled “Forever Country: Artists of Then, Now, and Forever”– is an epic country music mashup featuring 30 CMA Award winning superstars. The list of featured musicians includes big names like Luke Bryan, Brett Eldredge, Faith Hill, Lady Antebellum, Miranda Lambert, Martina McBride, Tim McGraw, Blake Shelton, Carrie Underwood, Keith Urban… Oh and of course, Dolly Parton. These artist, together with 19 others, cover a mashup of John Denver’s “Take Me Hope, Country Roads” with Dolly Parton’s “I Will Always Love You” and Willie Nelson’s “On The Road Again.” And it is spine-tingling good! The music video– directed by Grammy Award-winning director Joseph Kahn– was highly anticipated for fans and even for the artists themselves! The featured singers filmed the video in front of a green screen, so they were surprised by the final music video along with the rest of the world. Check it out below! Share with a country music fan today! This post was republished from inspiremore.com. You can find the original post here.